The Walking Liberty Half Dollar was minted from 1916 to 1947 and is one of the most beautiful coins ever minted and naturally makes a great ring. Silver content is 90% fine silver. This half dollar can be made from size 9 to 13. 1945. 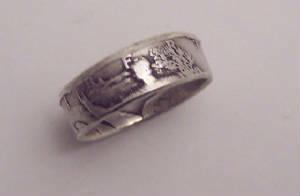 This Half Dollar Ring has its full natural patina. 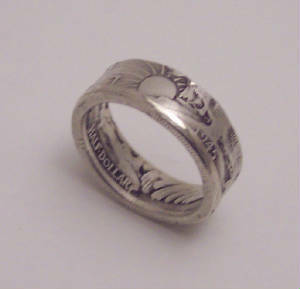 The Walking Liberty is an awesome coin and it makes a beautiful ring. You will receive this exact ring.